DUST MITE INFESTATIONS ARE FOUND IN 4 OUT OF 5 HOMES. GET RID OF THEM WITH THIS NATURAL SOLUTION! Dust mites. The tiny little bugs live in bedding, carpets, or any upholstered furniture and love to feed on dead skin cells. 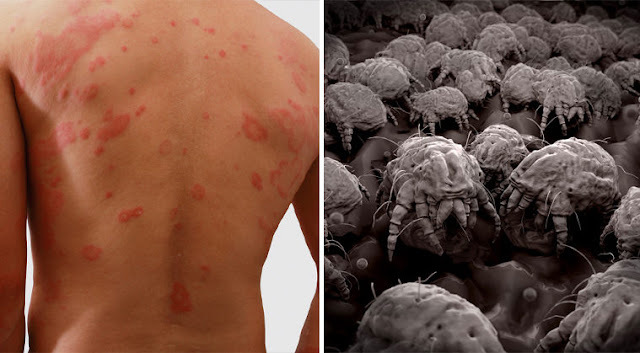 Dust mite infestations are found in 4 out of 5 American homes and they can cause an abundance of allergy- or asthma-related health issues, along with some skin reactions. Vacuuming and consistently washing sheets are a good way to keep dust mites out of the home, but some items like throw pillows and mattresses are not so easily cleaned. Also, if your vacuum does not have a hepa filter, most of the dust mites will end up back where they started. One great way to kill and repel dust mites is to spray them with an eucalyptus oil solution. 01: Spray down all items that cannot be washed. 03: Repeat 3 times a week to remove all dust mites. Unfortunately, eucalyptus essential oil is not safe for children under the age of 10. However, there are other oils that are safe and will also remove dust mites, such as clove and fennel essential oils, and they are safe for use with children over the age of 2. Check out the process in the video below!